Background: One out of five patients is unsatisfied to some extent after total knee arthroplasty (TKA). Unmet expectations are the main driver of post-operative dissatisfaction. Improved pre-operative education on realistic expectations for long-term outcome after TKA potentially leads to higher post-operative satisfaction. 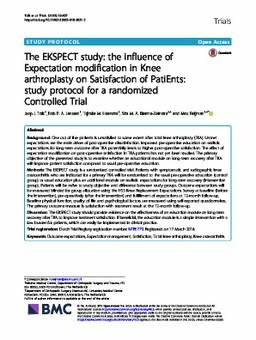 The effect of expectation modification on post-operative satisfaction in TKA patients has not yet been studied. The primary objective of the presented study is to examine whether an educational module on long-term recovery after TKA will improve patient satisfaction compared to usual pre-operative education. Methods: The EKSPECT study is a randomized controlled trial. Patients with symptomatic and radiographic knee osteoarthritis who are indicated for a primary TKA will be randomized to the usual pre-operative education (control group) or usual education plus an additional module on realistic expectations for long-term recovery (intervention group). Patients will be naïve to study objective and difference between study groups. Outcome expectations will be measured blinded for group allocation using the HSS Knee Replacement Expectations Survey at baseline (before the intervention), pre-operatively (after the intervention) and fulfillment of expectations at 12-month follow-up. Baseline physical function, quality of life and psychological factors are measured using self-reported questionnaires. The primary outcome measure is satisfaction with treatment result at the 12-month follow-up. Discussion: The EKSPECT study should provide evidence on the effectiveness of an education module on long-term recovery after TKA to improve treatment satisfaction. If beneficial, the education module is a simple intervention with a low burden for patients, which can easily be implemented in clinical practice.